When the 2019 regulations were under discussion a lot was said about the “out-washing” of flow from the front wing. This has been a feature of F1 cars since the regulation change in 2009, when the front wings were made to match the width of the cars (400mm wider from 1.4m to 1.8m across). The concept became more refined in the following years, becoming especially important from 2014 when the front wing span was made narrower by 150mm (from 1.8m to 1.65m). This out-washing of the air from the front wing plays a vital role in preventing the low total pressure, unsteady, and highly turbulent airflow behind the front wheels being sucked under the floor, which reduces downforce. By pushing this flow outboard the performance of the car is greatly improved, however, the wake of the car is made wider which negatively affects a following car over a greater width of track. To nullify this out-washing the FIA made a number of changes to the aerodynamic regulations for 2019; we don’t want to bore you with repetition ad nauseam on the specific changes so check out the archive of technical features if you’re unsure about the details. Our first study looking into the aerodynamics of the 2019 cars showed just how dramatic the loss of the out-wash flaps, cascades, and winglets could be for the ingress of the front tyre wake under the car, using the Perrin open-source F1 car as a base, and as a result the underbody downforce was slashed by ~25%. That study featured a very simplistic interpretation of the 2019 rules, by stretching and manipulating the original Perrin wings to comply to 2019 regulations; from launch a few teams front wing concepts drew much attention from commentators and fans alike, namely those of the newly rebadged Alfa Romeo team (formerly Sauber), as well as Ferrari, Toro Rosso, and to a lesser extent McLaren. The designs differ slightly in their execution but are conceptually similar, featuring a high level of incidence and camber near the centreline of the car, sweeping down to a low camber, almost horizontal, wing section at the endplate. The Alfa is the most aggressive of these designs, sweeping to almost zero incidence or camber at the tip; while the Ferrari is arguably the most refined design - the same inner flap shape was a feature of the Toro Rosso update in Australia. To start this second phase of analysis new parametric models were created for the front and rear wings, allowing a greater control over the spanwise chords, incidence, slot gaps and overlaps, cambers...etc. The new front wing model is still rather simple in execution, and thus is somewhat more akin to the Toro Rosso (from pre-season testing) than Alfa or Ferrari designs. There’s not much freedom when it comes to design of the endplates, but the new wing features a pair of cutouts at the rear of the endplates which, like the rear wing, try to reduce the upper endplate vortex strength. A feature of our first attempt at a 2019 car (hereafter referred to as 2019-01) was a high level of drag and downforce from the rear wing, so the rear wing incidence for 2019-02 (our second iteration of the car design) was blended out at the tips to try and move the aero balance forwards as well as reducing the tip vortex strength - reducing rear wing downforce by 5.7%, but also reducing rear wing drag by 17% when compared to 2019-01 (albeit still 31% and 23% higher on downforce and drag respectively than the 2018 rear wing). Another rumour ahead of the 2019 season was that the new front wing regulations would mean the wings would produce less downforce than in 2018, but 2019-01 produced 39% more downforce than the 2018 car. Reducing the loading towards the tips for 2019-02 has reduced the front wing downforce by 20% compared to 2019-01, but that is still 10% more downforce than the 2018 car. Again the disclaimer being that total downforce for all these wings is lower than an actual F1 entrant so the effect within the teams is not necessarily the same, but for this car in this case the front wing continues to produce more downforce than the 2018 spec wing. Shifting the aerodynamic loading to the centre of the front wing significantly changes the shape of the front wing wake, shown below. Whereas the 2018 and 2019-01 wings produce a rectangular shape wake 2019-02 produces a high degree of upwash near the y250 portion of the wing. The 2019-02 wake is also thinner and higher pressure than both 2018 and 2019-01, indicating that the wing could be “worked” harder (i.e. camber could be increased in places, though obviously not near the tip as this would defeat the purpose of the wing); this is also shown by the front wing drag which is 18% and 8% lower than the 2019-01 and 2018 cases respectively. The strakes and endplate footplate under the wing have also been re-profiled which is shown by a much more clearly defined trio of vortices under the wing. The change to the inboard shape of the wing has consequences for the y250 vortex, which is slightly elliptical in shape and with its centre a little further from the ground. The y250 works with turning vanes under the nose and the bargeboards to pull higher total pressure air from above the chassis downwards to the critical areas at the front of the floor and sidepods. As mentioned the out-washing of air from the front wing had the goal of preventing the front tyre wake from encroaching on the underbody, a job 2019-01 did very badly as the front tyre wake was both larger and passed directly under the floor (shown below). 2019-02 performs significantly better in this regard, and the front wheel wake is reduced in size and is also being manoeuvred outboard. 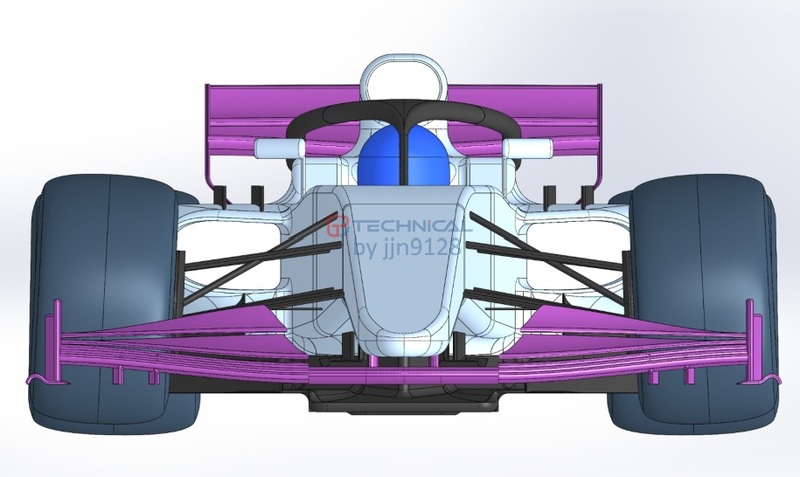 However, there are some issues closer to the middle of the car, as the increased upwash near the y250 portion of the wing means the front wing wake clashes with the suspension arms, causing an increase in the wake thickness of the suspension, and even some local separation; this issue was also present in 2019-01, though to a lesser extent. This is turn makes the region between the monocoque and wheel much messier, reducing the total pressure in this region where a high total pressure (Cpo ~ 1) is desired to feed the floor, and consequently the front edge of the floor performs even worse than the 2019-01 case. The front suspension arms on the Perrin are mounted lower on the chassis than most current F1 cars, so changing this area could yield significant benefits for the performance of the underbody. The bargeboards are also considerably less evolved than cars on the 2019 grid - which is the next area of development planned for this model. Even with this first attempt at an out-washing 2019 front wing the effect on the width of the wake is drastic; where 2019-01 slimmed the wake considerably from the 2018 case making the region of affected flow narrower than the width of the car by a few metres aft, where for the 2018 case the wake is around double the width of the car. The 2019-02 case has more than doubled the width of that low total pressure zone from 2019-01, albeit the wake still has a teardrop shape, where the 2018 car continues to grow as it reaches the edge of the frame. While the effect will not be as great as the 2018 case, this will have a knock on effect for cars following behind. This study shows how a change of front wing philosophy can have major implications on the direction of flow around the front of the car, which can adversely or positively impact the rest of the car. While our 2019-01 case is not congruent with the Mercedes/Red Bull designs it does appear that the Ferrari/Alfa design used in 2019-02 could be the more favourable concept; design of the bargeboards and underbody will depend on the flow from the front wing, so each team’s development path should continue with their chosen concept through to Abu Dhabi - Mercedes continue to plough their own furrow with their aerodynamic design anyway and 10 titles in 5 years plus a dominant display in Australia would indicate they continue to get things right. Although who is to say that the extent of development much further down the line allows for higher performing designs with one approach versus the other? Hopefully this case has also shown how tricky F1 design is, as a seemingly positive change to the direction of the front wheel wake is counteracted by the clash of the front wing wake with the suspension, which has reduced downforce from the floor. Join the discussion at viewtopic.php?f=6&t=27920&start=60!